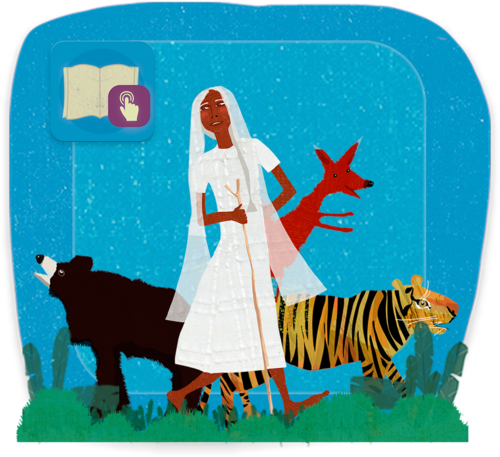 An adventurous storybook app—rich in gameplay—starring one spunky Grandma who hides herself in a giant gourd to trick a hungry bear, tiger, and fox in the forests of Bengal! Download the Activity Guide here! 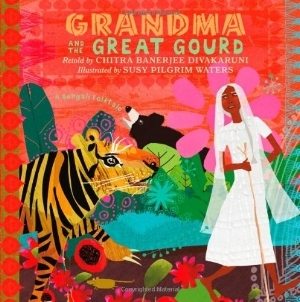 In the tradition of Little Red Riding Hood and Three Billy Goats Gruff, discover an interactive trickster tale from South Asia, based on the Kirkus Reviews award-winning picture book Grandma and the Great Gourd: A Bengali Folktale,written by Chitra Banerjee Divakaruni and illustrated by Susy Pilgrim Waters. Push Grandma through the forest and unlock the powers of five gourds of different shapes and sizes as you play a rollicking physics-inspired game! Created with input and guidance from advisors Frank Signorello, STEM educational consultant (New York Hall of Science, New York City Department of Education, Girl Scouts USA) and Preeti Gupta, Director of Youth Learning and Research, American Museum of Natural History. Create custom narrations for Grandma's story in your own voice or language as you experiment with literary elements such as onomatopoeia and alliteration in our Story and Sound Effects Studios. Then, hear your read-aloud recordings (including sound effects) play back in the story and in the rolling game! A great tool for bilingual or ELL learning, reading fluency, speech, coplay between caregivers and children, or differentiated learning! Take a field trip to Grandma’s world to discover the food, art, language, clothing, and wildlife of South Asia through a series of In-App videos. created in partnership with LitWorld, Wee-Care Foundation (Liberia) Daricha Foundation (West Bengal, India), Maverick Studios (Dhaka, Bangladesh), Chef Rama Ginde (Wanna Bee Chef), David Raju (naturalist, Singinawa Jungle Lodge), and Kavita Ramchandran (Make Believe Design Studios). The app features an original South Asian-inspired score by Kamala Sankaram. Praised as “strikingly original” by The New York Times, she is also the voice artist who brings all the human and animal characters in Grandma's story to life! "Stars a spunky Bengali grandma who outwits hungry forest animals wanting to eat her. In addition to a fun story, the app offers cultural awareness through added activities." "A vibrantly drawn, highly interactive app featuring strong female characters ... supported by a number of complementary extras. It should be a winner with young children."